In an economic climate which does not always make relocation as easy as it might be, we feel that in conjunction with architects and structural engineers at our disposal we can transform any existing property so to achieve its maximum potential. Whether it is a small or large extension or simply a complete overhaul of what is already there AJP Construction is happy to give any advice or ideas at their disposal to make your alterations completely hassle-free. A structural alteration to your home can make a huge difference to your livening space. Wheather it’s knocking through some internal walls to create an open plan kitchen / dining area or simply adding an extra door opening from one room to another. At AJP construction we have all the necessary insurances along with the knowledge and skill to carry out such work. We can also offer our insurance backed guarantee from the Guild of master craftsmen. It’s important to remember that a structural alteration to your home WILL require building regulation and structural engineer’s calculations. At AJP construction we can deal with the whole process, from determining whether the proposed works are structural to assigning a structural engineer, informing building control, carrying out the works and getting your building regs approval certificate upon satisfactory completion of the work. Loft and garage conversions are a very popular way of adding extra rooms to an existing property without the need for increasing the volume of your home. There is the problem of losing much-needed storage space but this can be easily overcome by integrating cleverly built-in storage solutions into the project. Another benefit of loft and garage conversions is that by enlarge they do not require planning permission, they can be done under permitted development and building regulation approval which will usually require structural calculations. Timber famed extensions and newly built homes are becoming increasingly popular for many reasons. They are constructed from sustainably sourced timber which means they are far more environmentally friendly than bricks and mortar, not to mention the speed at which they can be built which is often a deciding factor for many people who are unsure of which construction method to use. 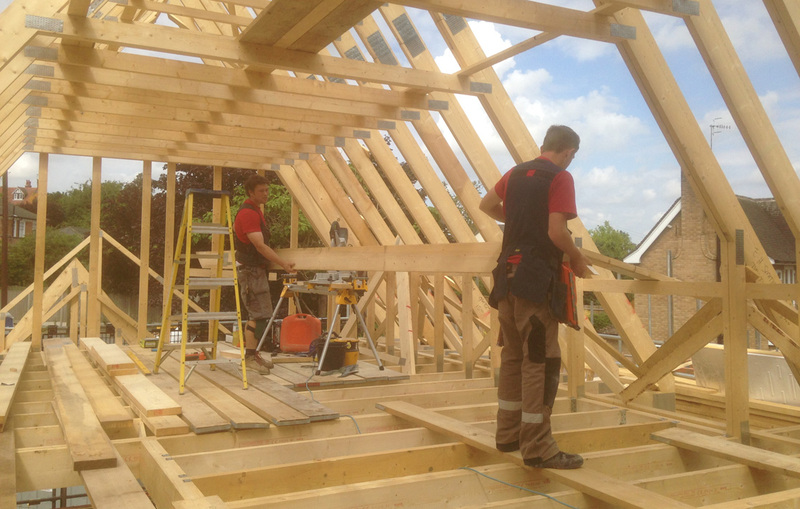 AJP construction’s carpentry based backed ground means we supremely placed to carry out even the most complex of timber-framed projects and roof constructions. Timber framed contemporary garden are hugely popular at the moment and it has created a market of its own with many companies which specialise only in the mass production of several different designs on a theme. At AJP construction we believe we offer a more bespoke approach to this impressive and striking addition to a clients back garden. We also carry all other construction task large or small such as all aspects of carpentry and joinery- internal doors, external windows and doors, supply and installation of hardwood flooring, skirting boards and architrave, bespoke joinery, stud partitions, supply and installation of kitchens, roof construction and roof covering, cedar cladding, installation of staircases. Other general construction tasks: Bricklaying, plastering, roofing, ground works, hard landscaping. AJP has worked tirelessly to forge long standing and fruitful working relationships with numerous large and small building contractors, developers and individuals who can re-iterate the professional and high end results attained whatever the project requires. These recommendations combined with our dedication towards our company infrastructure, site safety and customer relations are paramount. AJP are happy to answer any questions regarding anything on our website. If you are seeking employment with AJP on any of their future projects feel free to leave your contact details along with your preferred area of carpentry or trade in general and we will add you to our database when a suitable job arrives.